the point), at the Grant Museum. 1) This species is actually more often referred to as the common hermit crab but, its not very nice to be called common plus, I want to emphasise the reason I chose it. Check out that exclamation mark worthy right-hand claw! (At the top of the specimen on the right). The size of the gargantuanly disproportioned right claw is accentuated in our specimen on the basis it is missing its left claw (to clear up any confusion you may have been experiencing). But trust me when I say, the difference would still have been notable. 2) Hermit crabs are not all they seem. If you take a crab out of its carapace, there would be obvious attachment issues and it would not thank you. Plus various animal welfare charities would want to have words. Take a hermit crab out of its shell and, whilst it also probably wouldn’t thank you, you can do so with harming it; they’re not attached. They’re not even part of the same animal. 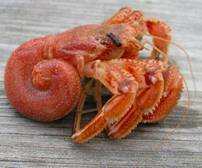 Hermit crabs are actually more closely related to lobsters and lack a traditional crabby exoskeleton of their own. Instead, they take up occupancy of an empty gastropod shell (hence I can say shell rather than carapace). As the ‘crab’ gets bigger, it swaps the shell for a larger one. 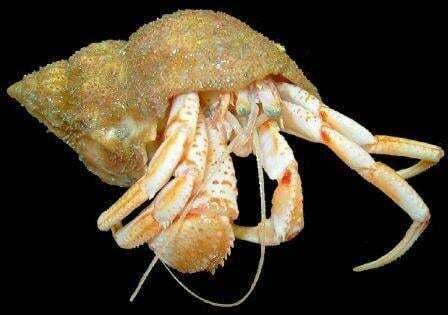 When out of its shell, the hermit crab looks like a prawn on steroids. If two hermit crabs meet and one likes the look of the others home, shell-envy ensues and induces fierce battles in which the winner will forcibly evict the loser and make off with its shell. Tough times. 3) About shells it can be a menace but when it comes to food the right-handed hermit crab is not fussy. It finds food by filtering organic particles from the water column or scavenging along the sea floor, and will eat almost everything. They are found throughout north-west Europe, and all over Britain. Or, around the outside of Britain, I should probably say. 4) Many individuals invest in a side-kick in the form of a sea anemone (called Calliactis parasitica) which they carry on top of their shell. This cross-species marriage provides an additional level of protection against predators for the crab, and improved culinary delights for the anemone. An excellent example of a symbiotic relationship. Aw. 5) The right-handed hermit crab matures at around the age of one. Although it is the same species of hermit crab that inhabits both shallow and deep water, they have slightly different reproductive strategies. Along the shoreline, crabs tend to get jiggy less often, with a peak in January and February. However those living in deeper water are known to carry on regardless and females have been seen carrying eggs all year around. After two months of being carried by the mother, the eggs hatch into tiny little larvae. Very interesting! I didn’t know they were related to lobsters, although this makes sense. I once found a hermit crab in a cave (it was near-ish the sea) and it decided to leave its shell. No amount of persuasion would convince it to put its shell back on, even though it would have been vulnerable without it. The crab left the cave in a huff, stark naked. I felt terrible.